The Sonoran Gopher Snake is an albino form of the Gopher Snake and is a very robust snake. 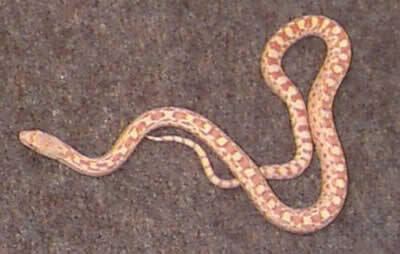 The Sonoran Gopher Snakes generally do not bite, but if not yet tame they will hiss loudly and squirm a lot until tamed with gentle handling. A good pet for someone who wants a big snake as they are larger than a rat snake or a kingsnake. The Sonoran gopher snake is very hardy and easy to maintain. Distribution: The Gopher Snake is found in North America, specifically in the western part of the United States from southern British Colombia to Baja California. The Sonoran Gopher Snake ranges in southeastern California, all the way east into western New Mexico. Gopher Snake - P. catenifer found in the western states. Pine Snake- P. melanoleucus found in the southeast and Gulf states. Bull Snake, P. c. sayi found in the Midwest. Description: This snake will grow to between four and six feet, the males average 4-4.5 feet, females 5-6 feet. They have the general appearance of a rat snake, though much heavier bodied. They also have a beaked appearance a somewhat recessed lower jaw, adaptations for burrowing. The natural color of the gopher snake ranges in variegated shades of white, brown, and black. The scales are heavily keeled. Feeding: They are a constrictor and their diet consists of mice, small rats and chicks. Feed once or twice a week, depending on the size of the food and the size of the snake. As you get to know your snake, you'll learn what its feeding needs are. Fresh water in a shallow dish should always be available. Environment: They are best kept singly except when they are being bred. The Sonoran Gopher Snake needs to be housed in a desert or woodland type terrarium. They are burrowers, so a sand substrate is good for them See the terrarium set-ups described under Basic Reptile and Amphibian Care for more information. The terrarium needs to be a 20 gallon size or larger, and the snake will need a hiding place and a small water dish. They also likes to climb, so a vertical or semi-vertical tree limb with some plant vining is great. Temperature and Lighting requirements: They do well at 77° - 86° F (25° - 30° C) in the daytime. Full spectrum lighting is important for your snakes well being and its long-term maintenance. You can use a substrate heating device for basic heating. For additional heat, you can add a full spectrum incandescent daytime bulb and a blacklight bulb or red incandescent bulb for nighttime heating. Be sure you use a thermometer so you don't let the terrarium become overheated! Breeding/Reproduction: These snakes lay ten to 20 eggs about the size of a small chicken egg. They will be deposited under a log, a stump or a rock pile. The hatchlings are about 15 inches (38.10 cm) long and resemble the coloring and patterning of their parents. Availability: The Sonoran Gopher Snake as well as regular Gopher Snakes are very common and readily available. Sonaran Gopher snakes is definitely a good pet, the only time mine gets cranky, well all my snakes tend to is when its feasting time, or shedding time, but hey, I'd be pissy too if someone bugged me when I was trying to get rid of my skin! Definitely a great starter pet, and just make sure you do have a cage lock cause they are definitely the smartest pet I have had and gets out all the time. Unlike my Moniter that gets stuck under my fridge every freaking day in the same spot. I don't know where people get the idea that Gopher Snakes are burrowers. Yes, they enter many burrows but that is because the scent of rodents is strong in those burrows. I have never seen nor heard of a Gopher burrowing on its own. Now, there are snakes which burrow such as Chionactis and Chilomeniscus to name a couple but the majority of their burrowing takes place in soft substrate or sand. Uh my gopher snake is an extreme burrower and he burrows in thick aspen bed. I think your mistaken by the use of the word "burrowing". I have 3 Sonoran Gopher Snakes myself and keep them on coconut fibre or aspen, and they do "burrow" meaning they completely disappear into/underneath the substrate. If the substrate is just right they can make a maze of tunnels but usually destroy them soon after. Many other snakes display similar "burrowing" habits, kings, milks, rainbow boas, sand/rosy/rubber boas, just to name a few. Where as I have never seen a boa constrictor, carpet python or ball python exhibit any of this behaviour. Not to say they don't do it, I just haven't witnessed it with my animals. Well my SGS burrows all the time, of course we have provided a deep enough substrate to allow her to do so, she seems to love it. She has burrows going all over in her enclosure. So now you have heard of an SGS that burrows. My gopher snake is sneezing and it hasn't eatin her pinkies for almost a month and a half. What do I do? I have three Sonorian Gopher snakes. Two males and one female, but my one male is not very friendly at all and will hiss and strike almost everytime I open his enclosure. My dad caught "Slimy" crossing the street of our suburban neighborhood -- definitely not a safe place for a snake. He was obviously someone's escaped pet because he was very mellow from the beginning. I got over my phobia of snakes thanks to him.